CoreLogic's home value index revealed dwelling values edged 0.2 per cent higher across Australia over the month, led by a 0.3 per cent rise in capital city values and a 0.1 per cent gain across the combined regional markets. The latest figures take national dwelling values 0.5 per cent higher over the September quarter, which is the slowest rate of quarter-on-quarter growth since June 2016, and national values are up 8.0 per cent over the past twelve months. CoreLogic head of research Tim Lawless said the combined capital city trend growth rate is clearly losing steam with dwelling values rising by 0.7 per cent over the September quarter and well down from the recent peak rate of quarter-on-quarter growth which was recorded at 3.5 per cent over the December 2016 quarter. 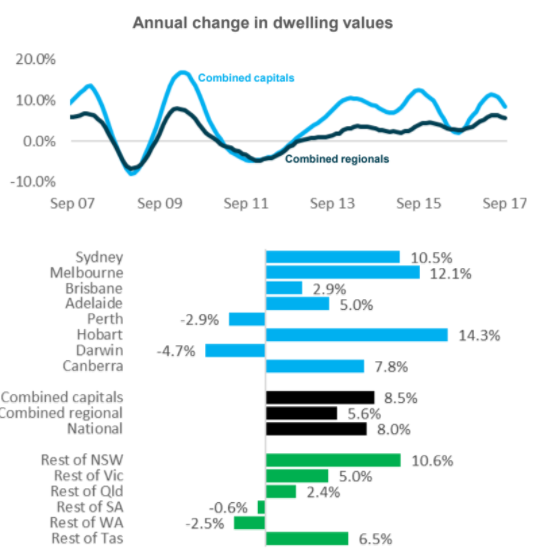 This slowing in the combined capitals growth trend is heavily influenced by conditions across the Sydney market where capital gains have stalled." “Potentially the affordability challenges facing Sydney buyers within the detached housing sector are pushing more demand towards the medium to high density sector, where, based on median values, houses are almost $290,000 more expensive than units," Lawless said. Melbourne’s housing market is also showing slower growth conditions, however growth remains relatively resilient compared with Sydney. Dwelling values were almost 1 per cent higher over the month of September and rose by 2.0 per cent over the September quarter. “The stronger housing market conditions in Melbourne are supported by auction clearance rates which have consistently remained above 70 per cent," Lawless said. Hobart further cemented its position as the best performing housing market after a recent history of sluggish growth conditions. The past twelve months has seen Hobart dwelling values surge 14.3 per cent higher; the highest annual growth rate since 2004. Despite the strong capital gains, the cost of housing remains substantially lower than any other capital city with a typical house value of $412,340 and a median unit value of just under $320,000. The remaining capital cities have shown a diverse performance over recent months. Perth dwelling values look to be moving through the bottom of the cycle, with values edging 0.1 per cent higher over the month, however values remain down over the quarter and year. 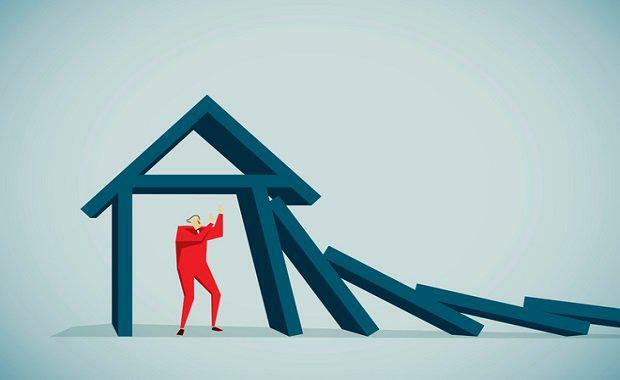 For Darwin, the housing market isn’t showing the same signs of bottoming out with dwelling values slipping 0.7 per cent lower over the month and 4 per cent lower over the September quarter. In Brisbane, the market has seen a growing divergence between the performances of houses compared with units; house values were 0.2 per cent higher over the month to be 4.0 per cent higher over the year, while unit values showed an increase over the month but remain 2.5 per cent lower over the past year. Adelaide dwelling values held firm over the month but have shown a 5.0 per cent rise over the year. Across the regional areas of Australia, growth rates have generally been lower compared to capital cities performance. The combined regional housing markets saw dwelling values unchanged over the September quarter compared with a 0.7 per cent rise in capital city dwelling values. Similarly, over the past twelve months regional values were 5.6 per cent higher compared with an 8.5 per cent rise in capital city values. While the pace of capital gains is generally slowing, growth in weekly rents has shown some upwards momentum, particularly in Sydney and Melbourne. A year ago capital city rents were rising at the annual rate of just 0.8 per cent. The past twelve months has seen this annual pace of rental growth ramp up to be 2.8 per cent over the twelve months ending September. Sydney rental growth has increased from 2.2 per cent a year ago to be up 4.8 per cent and Melbourne rental growth is now tracking at 4.8 per cent, up from 2.4 per cent a year ago. The improved growth in weekly rents against a backdrop of slowing capital gains has seen gross yields level out in Sydney at 3.1 per cent, however Melbourne yields reduced further over the month to reach a new record low of 2.91 per cent. 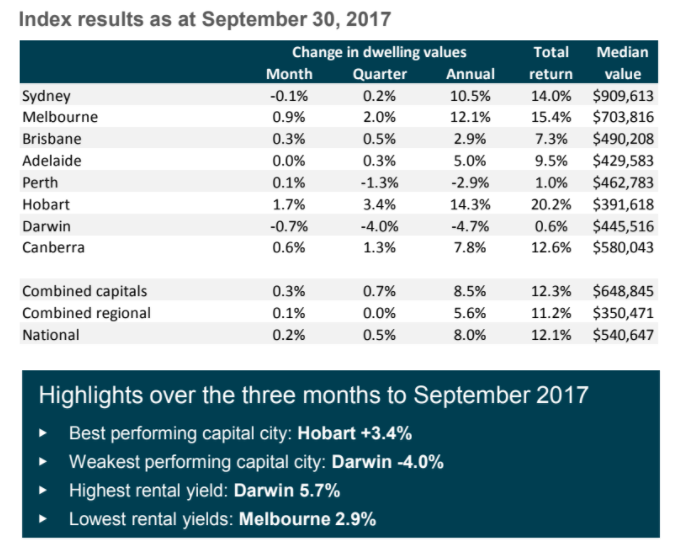 Darwin is once again recording the highest rental yields due to the fact that dwelling values are falling at a faster pace than rents, while Hobart isn’t far behind with gross yields reducing but remaining around the 5.0 per cent mark. “The more subdued housing market conditions now playing out are likely the result of a combination of factors, namely, the clamp down on investment and interest only lending which is likely to have a knock on effect for the Sydney housing market more than any other city," Lawless said. Investment mortgage rates are generally showing a 60 basis point premium over owner occupier rates, and premiums are higher for interest only loans. “Slower rates of capital gain against a backdrop of low rental yields and tighter finance is likely to be creating a dent in investor sentiment and potentially encouraging investors to seek out markets with a more balanced yield profile coupled with better prospects for capital gain." Lawless said. While investor demand may trend lower due to higher mortgage rates and tighter credit policies, first home buyers are increasing their presence across the housing market. Based on housing finance commitments data, first home buyer activity surged higher in New South Wales and Victoria as first timer buyers took advantage of stamp duty concessions that went live on 1 July. Between June and July, the number of first home buyer commitments increased by 28 per cent across New South Wales and 11 per cent across Victoria. First home buyer numbers are trending higher across other states where stamp duty rules were unchanged, suggesting that lower affordability barriers and an increasing appetite for owner occupier lending is fuelling a broader rebound across the first time buyer segment. Population growth is another factor impacting housing demand. Recently released demographic statistics from the ABS highlight a surge in overseas migration rates. The fastest rate of population growth is in Victoria at 2.4 per cent, which is likely one of the key factors contributing to the resilience of Melbourne’s housing market to a broader slowdown in value growth. Net overseas migration surged higher across most of the states over the March quarter, reaching new record highs across both Victoria and New South Wales. “While CoreLogic anticipates that dwelling values will trend lower across Sydney and potentially Melbourne later this year or next, strong demand for housing, along with mortgage rates anticipated to remain low, will help to support a floor under housing prices going forward," Lawless said.